Black sunglasses, a baseball cap flipped backwards and a laptop: His visual trademarks simultaneously serve as his most important tools. Those and his keen sense for superhits that generate 9-digit streams and have so far enabled him to move crowds across the globe for the past one and a half years. The young man from Lower Saxony is actually more the reserved type, who would much rather stand behind his decks and let his music do the talking. Robin Schulz: A picture perfect career. Making his way from a local secret to the nation’s ‘next big thing’ and finally to an internationally acclaimed mega star. At age 28 the producer and DJ has already established himself as the most successful German club act to date and is now set to lay forth his sophomore album. 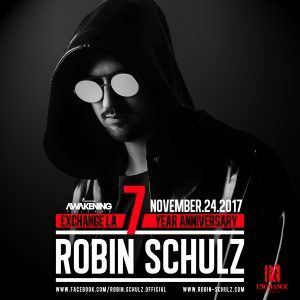 Robin Schulz began playing smaller clubs as a DJ somewhere in rural Lower Saxony. Meanwhile, he has travelled the world: Osnabrück, New York, Tokyo. And more importantly, the world knows him. His 2014 breakthrough single, the multi-platinum certified Top 1 remix of “Waves (feat. Mr. Probz)” was a first sign of things to come. Though not even Schulz himself could have predicted last year’s incredible snowball effect and the extent of his current success. 2014 marked the start of a fairytale summer that knew just one name: Robin Schulz. His internationally gold- and platinum-certified follow-up single “Prayer In C (feat. Lilly Wood & The Prick)” went on to become a global hit and write history, with Schulz as the first-ever German artist to reach the #1 spot of the global Shazam charts. Subsequently “Prayer In C” was officially named the “Summer Hit of 2014” and rightfully so.